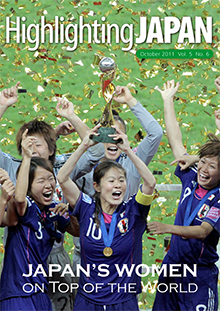 Japan's World Cup winning soccer team kicks off this month's special feature on Japanese women achieving big things overseas. Amputee athlete Maya Nakanishi is targeting world records in three events in addition to winning medals at the 2012 London Paralympics. Eighty-four-year-old Akiko Sudo has been providing medical assistance in Haiti for over thirty years. Azusa Chiba, a development worker with UNOPS, is playing a part in the remarkable changes taking place in the newly established Republic of South Sudan. Osamu Sawaji speaks with one the partners in leading architect group SANAA, Kazuyo Sejima, about the firm's work. A Q&A with Sakie T. Fukushima, president of recruitment consultants G&S Global Advisors and vice chair of the Japan Association of Corporate Executives. The Japanese-Australian Environmental Conservation Program was held on the UN World Heritage Site of Yakushima island in Kagoshima Prefecture in September. Dr. Masaru Tanaka, chief research fellow at the International Institute for Advanced Studies, explain his vision for the new field of H2O Studies. Forestry Agency Director General Yoshitsugu Minagawa talks with Osamu Sawaji about the current state of the forests in Japan and around the world. Prime Minister Yoshihiko Noda visited the United Nations headquarters in New York in September and delivered two speeches to world leaders. Yokohama Triennale 2011 offers visitors a "magical" experience of the arts through November 6 at two main venues in Yokohama. A team of scientists led by Professor Noriyuki Nishida of the Nagasaki University Graduate School of Biomedical Sciences has developed a new way to diagnose CJD. Gavin Blair examines the foresight of high-end spectacles manufacturer Masunaga Optical in Fukui Prefecture. Julian Ryall visits the Itchiku Kubota Art Museum in Fuji-Kawaguchiko, Yamanashi Prefecture, to view the extraordinary kimonos designed by world famous textile-dyeing artist the late Itchiku Kubota-and his family and appprentices.